During the next 3 days you can Hop between our Designers to see what they have created with all of our New Products. Each day you will have a chance to win a $10.00 Gift card to My Treasured Kutz store. Along with a “FREE” SVG Digital Cut File per day, and a 25% discount code for any purchases at My Treasured Kutz for the month of July. To participate, please visit each of the Designers’ Blogs for inspiration for all the Christmas Products. Comment and show them some love for all there hard work. We will choose One Winner each day to receive the $10.00 Gift Card to My Treasured Kutz store. The winners will be posted Saturday, July 11th on the My Treasured Kutz Blog. So check back and follow the instructions posted there if you are one of the winners. Also, as your hopping between blogs, look for the post with the link for the Daily “Free” SVG Digital Cut File and the 25% Discount Code. "Nippy The Snowman" is crashing in to with you all a "Merry Christmas." 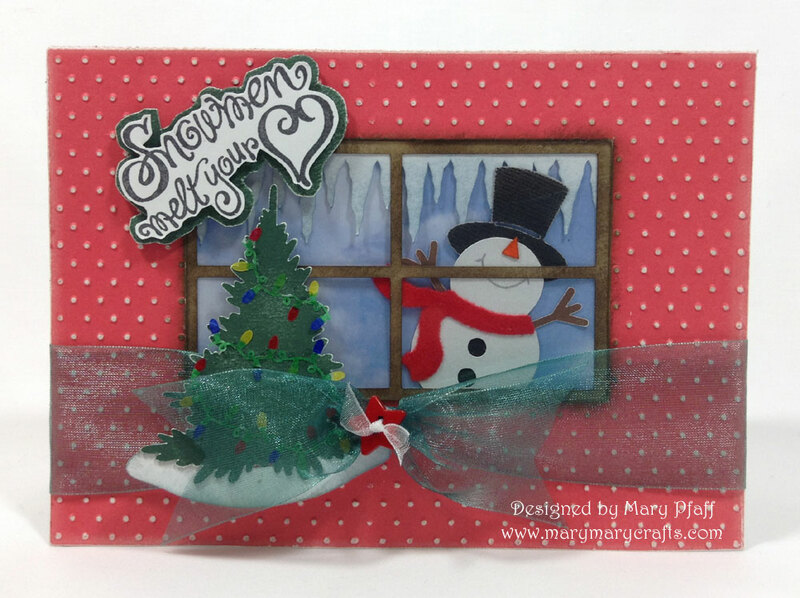 This card was created using the "New" My Treasured Kutz Christmas Release. You can create this card using MTK-CK-4099 Nippy The Snowman die and these SVG Digital Cut Files: MTK-D-1087 Decorating The Tree, MTK-D-1095 Max The Penguin And Nippy The Snowman Accessories. These will all be available on Friday, July 10th on the My Treasured Kutz website. "My Treasured Kutz Christmas In July Blog Hop"
Please come back tomorrow and thursday for two more exciting days! Oh my.. so cute and adorable! Great design! Very very cute idea!! SCRAPLIFTING!! TFS! What a fabulous, happy snowman. Love the tree too. Fabulous card! Perfect card all around I absolutely love it!!! Eeekkk - he's tooo cute! I love how he's peeking in from the cold snow outside, perfect sentiment too! I love everything about this card. Awesome job on the details. The sentiment is super sweet. I love window cards! Super cute with the snowman. Adorable card! I love the scene. All creative rights reserved. All content (including text, photographs and designs) are © Mary Pfaff, and may not be taken from this site without my written consent. My artwork is shared for personal inspiration/ non commercial use only, and may not be copied for publication or contest entry. I am a freelance designer. I maintain the freedom as an independent designer to say what I truly think of there products. I will never recommend something that I do not personally use. All content (including text, photographs and designs) are © Mary Pfaff. Simple theme. Powered by Blogger.